Ulthera: Does Ultherapy Really Work to Lift and Tighten the Skin? If you have not yet heard of Ultherapy it is a non-invasive procedure that is intended to lift and tighten the skin. It sounds almost to good to be true, right. So, the question is, does it really work? The short answer is, yes it does work, but before you make any decisions, you need to know what kind of results can be expected. First, non-surgical treatments will always give a non-surgical result. If you are hoping for a cheeper alternative to a facelift, mini-facelift or even lifestyle lift, you will be disappointed with Ultherapy or ANY non-surgical treatment. During a traditional facelift the surgeon address lax facial muscle, fat and repositions the skin. Ultherapy is not a facelift and a facelift is not a skin treatment. One procedure does not replace the need for the other. As we age collagen production progressively declines, which leads to wrinkles and thinning skin. Not to confuse facial volume (fat) loss, with skin (dermal/ epidermal) thinning, they are different concerns requiring different procedures. Like many of the treatments used in the world of medical aesthetic, Ultherapy is used to stimulate collagen. What makes Ulthera so unique is the way it stimulates collagen, where it stimulates collagen, the amount of increased collagen and the duration that collagen production is up regulated. Initially the targeted tissue will contract causing a tightening effect. As the renewal process continues collagen production is up regulated, improving skin density and giving a modest lift. The increased collagen is seen at multiple levels of the dermis, most prominent in the deeper dermal tissue. This up regulation of collagen continues, on average of a year. Although, Ultherapy is currently the only non-invasive treatment that can claim to lift skin, there are other treatments that can tighten the skin. Skin tightening is generally seen when aesthetic treatments target the dermal layer of the skin and stimulate collagen production. Ulthera works by targeting deep into the dermal tissue and also to the top of the facial muscle, leaving the surface intact. This is important because other non-surgical treatments, like RadioFrequency (RF) and laser do not treat at the same depth. Although, RF treatments can target fairly deep into the dermal area, the targeted area is only heated to a tempeture that will cause tissue contraction, this helps to tighten the skin. The difference is that RadioFrequency (RF) treatments do not heat the targeted area to the needed tempeture to achieve optimal collagen synthesis. Laser resurfacing and fractional resurfacing treatments, do heat the target area to optimal tempeture and will definitely generate significant collagen synthesis in the upper-mid dermis, which is ideal for treating lines, scars and skin texture. 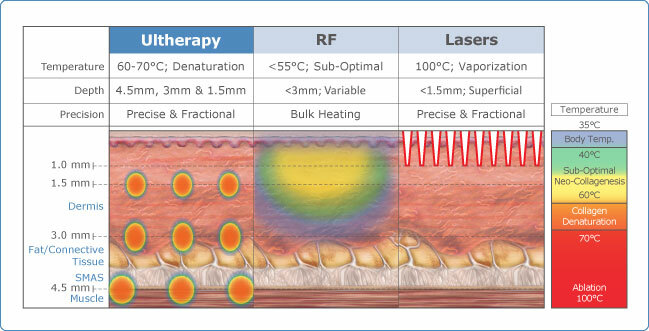 The difference is that we can not treat as deeply into the dermis with laser resurfacing as we do with Ultherapy. Most importantly, RadioFrequency (RF) and laser do not target the top of facial muscle, where Ultherapy does. Ultherapy does work, very well actually. Ultherapy is most appreciated when it is part of a comprehensive approach to anti-aging. This entry was posted on Monday, August 3rd, 2015 at 12:10 am	and is filed under Anti-aging, Ultherapy. You can follow any responses to this entry through the RSS 2.0 feed. You can leave a response, or trackback from your own site. I’ve heard a lot about ultherapy causing fat reduction and volume loss in the face months after treatment. Can you comment on this? Quite a few reviews on RealSelf.com speak of this and some doctors even say it absolutely does cause this while others say it only happens IF and WHEN the technician isn’t properly using the device. And I see where other doctors even advertise it for spot treating areas for fat reduction. Yup, ultra-therapy is an effective approach to skin tightening. It can help a person with skin rejuvenation. As a person goes older, the aging process inescapably takes a huge toll on his skin. Even an appropriate skin care regimen can’t stop wrinkles from appearing. Fortunately, there is a non-invasive aesthetic procedure known as ultra-therapy that can lift the skin by eliminating the fine lines and wrinkles. Well, it is a lunch-hour treatment that does not necessitate any aftercare.